Abstract - Mobile Ad-hoc Network (MANET) is a group of wireless nodes join together to form a network without a defined architecture. It is formed dynamically as the nodes are mobile in nature. This characteristic of MANET could lead to insecure information exchange. Applications in Mobile Ad-hoc Networks (MANET) such as military or public emergency network require secure multicast communication. Multicasting supports group oriented communication. A cluster based system provides easy key management within a cluster or a group. In such an interaction system, a new member can join and a current member can leave at any time. This overcomes the issues of energy consumption, end to end delay, unreliability with high packet drop rate and low key delivery ratio. Also, the communication among the existing members can be made secure by using an efficient key management technique. 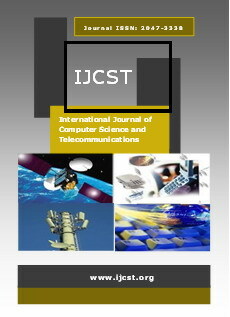 The proposed method is efficient and more suitable for secure multicast communication dedicated to operate in MANETs. Performance analysis of non-clustered and clustered method of key management in MANET is done. Abstract - In this paper, we presents a new classification algorithm called( LEM+ID3) and extending our previous work, which is based on the techniques from the learnable evolution models (LEM) to improve convergence and accuracy of the algorithm and use of ID3 in order to construct the tree used in classification. We converted LEM from optimization domain to classification domain and then examine the feature extraction problems and show that learning evolutional can significantly enhance the performance of pattern recognition systems with simple classifiers. We have applied this model to real world datasets from the UCI Machine Learning databases to verify our approach and compare our proposed approach with other reported results. We conclude that our algorithm is able to produce classifiers of superior (or equivalent) performance to the conventional classifiers examined. Abstract - Recently Wireless Sensor Networks (WSN) has gained research interest for remote area monitoring and tracking in unattended environments. WSN may be heterogeneous to provide resources and aggregation of resources will be helpful for efficient distributed computing. Sensor nodes in WSN are used to collect application specific data, perform some pre computing and send the computed values to sink nodes or base station where the application resides. Usually message sending is done by multi hop forwarding. Since each node is battery powered, the major goal of WSN is to maximize the battery life time. Among the different types of routing methods cluster based routing is the best one for energy conservation. But some of the nodes either do not cooperate for routing and forwarding the data or perform malicious activities such as fabrication, content alteration and Denial of Service attacks. In this paper the performance degradation of WSN due to non cooperative nodes is studied. Simulation result shows that performance is degraded in a significant level when some nodes of WSN are non cooperative. Abstract - This article briefs a survey on software security techniques. Software security testing is not the identical as testing the correctness and competence of security functions implemented by software, which are most frequently verified through requirements-based testing. These tests are important; they expose only a small piece of the depiction needed to verify the security of the software. Security testing is necessary because it has a distinct relationship with software quality. Software meets quality requirements related to functionality and performance, it does not necessary mean that the software is secure. Abstract - Biometric authentication of a person is highly challenging and complex problem. Face and gait identifications in video have received significant attention. Consequently, their identification problems have challenges due to their large varying appearances and high complex pattern distributions. However, the complementary properties of these two biometrics suggest fusion of them. Face identification is more reliable when the person is close to the camera. On the other hand, gait is a suitable Biometric trait for human identification at a distance. In this paper we have discussed multimodal biometrics to increase the security level. With the fusion of multiple biometrics we can minimize the system error rates, Moreover, we have mentioned some of the most recent algorithms developed for this purpose and attempts to give an idea of the state of the art of face and gait recognition technology and a brief overview of Biometric methods, both unimodal and multimodal, and their advantages and disadvantages, will be presented. Abstract - With the growing of wireless network technology researchers find that Wireless Sensor Network (WSN) is one the newest technology to make the life more comfortable and interesting. Security is needed to ensure the communication between the sensor node which is already a part from the same network and not outside intruder or attacker. To guarantee implementing the security in wireless sensor network, there are many protocols coming into the picture; this project selects the recent two protocols SRTLD and BIOSARP for critical analysis and investigation. After comparing the power consumption and delivery ratio to guarantee long life time for sensor node and to ensure the wireless senor network is working probably. According to what we reviewed there is an essential need to critical analyzes the recent security protocols in WSNs to determine which protocol is suitable for each network and application type. Two different security protocols for wireless sensor networks (WSN) will be analyzed to study the most effective protocol. After implementing BIOSARP and SRTLD using NS-2 simulator the project found that SRTLD is better energy consumption by 16.82%, but in delivery ratio BIOSARP is better by 4.21%. Abstract - The RED queue management algorithm achieves high throughput and low average delay by detecting and avoiding the incipient congestion. The detection of incipient congestion is based on calculation of average queue length and RED parameter settings. To avoid the congestion in the network, operators should have a priori estimations of average delay in congested routers, which is difficult to estimate in Mobile Ad hoc Network due to uncertainty in changing the network conditions. To achieve high throughput and low delay, it needs constant tuning of parameters according to the current traffic condition. Our goal in this paper is to achieve high throughput and low delay in congested network by efficient parameter adjustment and continuous tuning of queue parameters according to the changing of network condition.